Who Dat? Who Dat! Who Dat? So I am not a football fan like the way I am a basketball fan but watching that game this past weekend and watching the Saints get a win they deserved more than anyone really hit close to my heart. 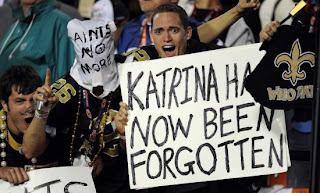 I remember when Katrina hit and how devestated I was for that city because not only did Houston feel the effects, but I also saw how many people lost what they never thought would disappear so quickly before their very own eyes. I made some close friends who relocated to Houston and watching their strength and courage and how they new without a doubt their city wound be back, made me rethink how lucky I was. I have been in many hurricanes and have been without power for weeks but I never was devestated the way the city of New Orleans was that August day. So I get to thinking, what would any of us do if we saw the things we cherish the most just be taken right from under us. For me being in those hurricanes really opened my eyes as to what I need to start appreciating more, the little things in life. I take my bed and shower for granted and I am sure a lot of us do, and yet there were people who lost everything that day, so it really reminds me of how lucky I am to wake up everyday in a warm bed and be able to shower. 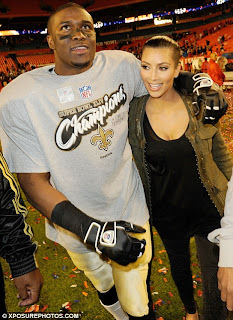 Reggie Bush hold that champion trophey made me proud to be from the south and be a Saints fan!